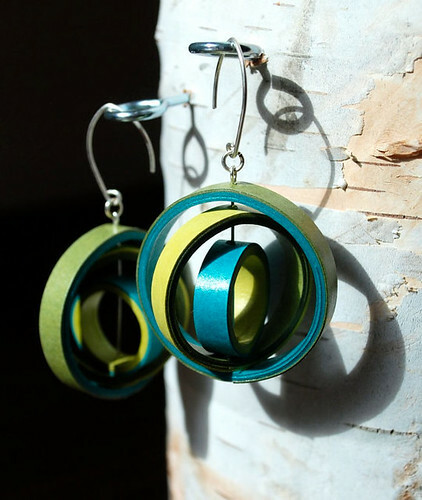 There's something so appealing about paper jewelry - its seemingly fragile nature draws people in for a closer look. Admirers are always curious - dare I say even suspicious - as to whether it will survive a wearing. 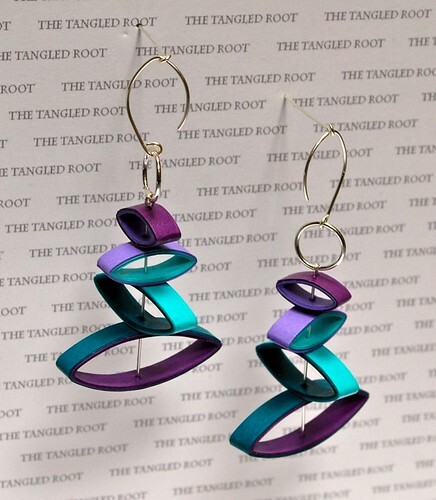 With care and common sense, paper jewelry can be worn again and again. I've gathered images from a handful of my favorite paper jewelry artisans and will be featuring more in the future. Luis Acosta is an Argentinian artist who lives and works in The Netherlands. 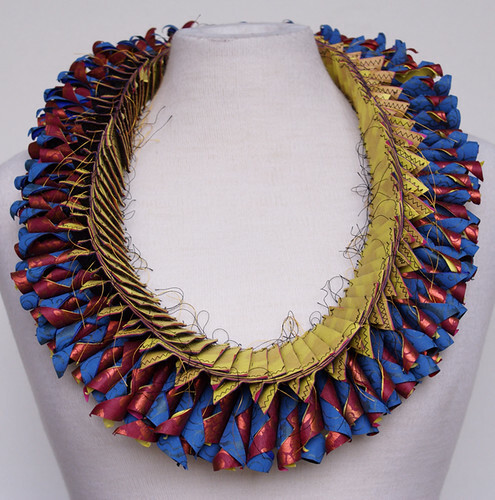 Originally trained in weaving, his distinctive paper jewelry art pieces are coiled, folded and stitched, and recognized for their vibrant colors, repetitive shapes, and dimensional layering. Luis's work has been shown internationally and is in museums and private collections worldwide, including the Museum of Arts and Design in New York City. 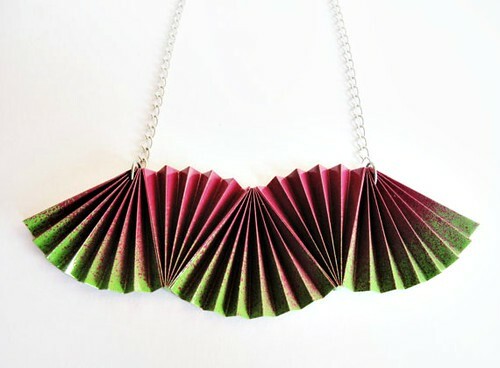 Ombretta Banfi in Toulouse, France, owner of Etsy shop Vasariah Creations, is an editorial illustrator who has been creating paper jewelry for four years. 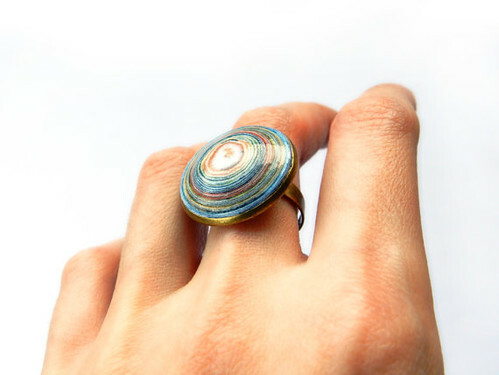 Ombry hand rolled recycled paper to make this multi-colored cabochon and affixed it to a brass ring. 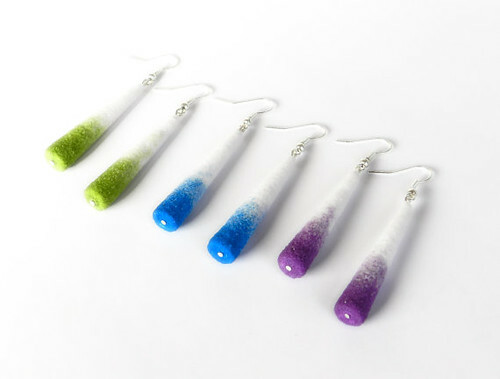 These lovely and unusual stick earrings are composed of rolled paper and colored sand, a technique Ombry developed while collaborating with an Italian firm on a sand-made drawings project for children. She coats the earrings with a water-based varnish, thus they aren't waterproof, but they will be fine unless you take them for a swim. 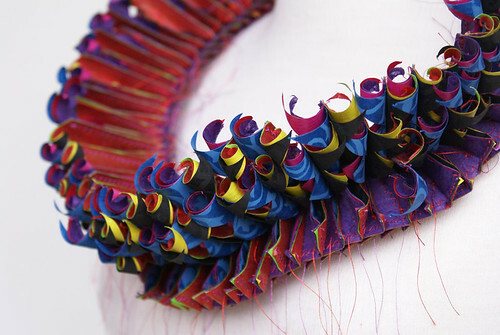 I've featured British paper artist Liz Hamman and her woven and origami-based paper jewelry previously here and here, and I always admire the varied pieces she creates. Liz works almost exclusively with recycled or upcycled paper. 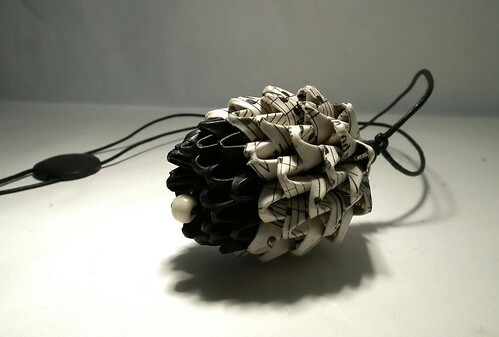 She folded sheet music to create the pine cone necklace above. The polished beauty below is part of a TextTextureTextile series and features a book (text), crochet (textile), and embroidery with beads (texture). 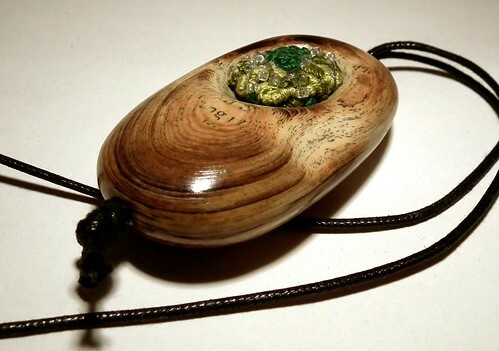 A visit to Liz Hamman Paper Jewellery on Facebook is where I learned her work is included in a current exhibit titled Boundless - The Book Transformed in Contemporary Art at the Mesa Contemporary Arts Museum in Mesa, Arizona through August 10. The opening reception is Friday, May 9. Txe in Spain of Paper in the Pocket [edit: no longer available] is a designer and painter who relies on paper folding to make many of the items in her Etsy shop - not just jewelry, but also lamps, mobiles, and home decor. 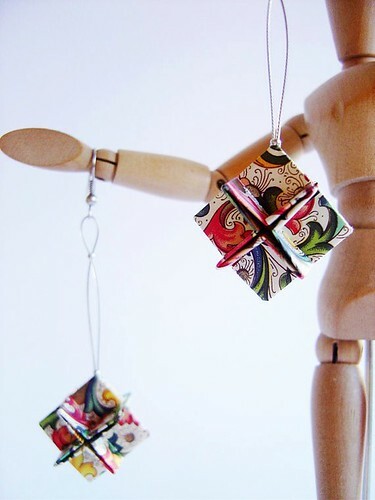 She used squares of paper imported from Florence, Italy to make these pretty OKU origami earrings. This statement necklace in her SHIRO collection has me thinking of watermelon slices on a hot summer's day! Txe told me she paints the paper after it is folded. ...while the circles in this Orbium pair are fixed. With a background in architecture, Kimberlee is also a partner in Etsy shop Rogue Theory [edit: shop has closed], makers of stylish fabric iPad cases and more. Each one a true masterpiece. I am a fan of Ombretta's perfect beads. Great finds! I especially love the ring and the rotating earrings. Casey, I actually thought of you when I saw those earrings - I had a feeling you would like them! These are gorgeous. I also like that the artists sometimes utilize recycled paper. So glad you like them, Licia and Kim.